Look and listen to the sounds of Hawaii's majestic surf as it rolls in right beneath the windows of this cozy ocean bluff condo. Kai Nani at Sealodge is the perfect spot for a honeymoon or a romantic island getaway. Kai Nani means 'beautiful ocean' in Hawaiian. True to its name, our Sealodge condominium (Unit #G-2) offers some of the most spectacular ocean views in Princeville. Perched dramatically on cliffs overlooking the waters of the blue Pacific, Sealodge is a small low-rise complex, its wind swept cedar siding in perfect harmony with the ocean environment surrounding it. 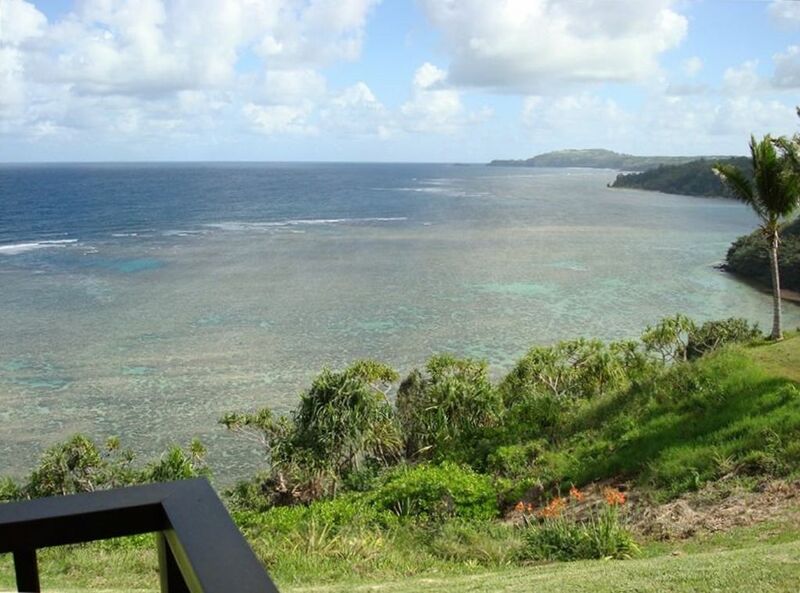 Kai Nani is a one-bedroom one-bath first floor unit which faces east/northeast and looks directly down the coastline to Anini Beach and the Kilauea Lighthouse. There is an unobstructed ocean view from every room in the condo, and the gentle sound of the surf permeates the air. The covered deck that juts out toward the cliff from the living room is a perfect spot to sit and watch the waves and the often visible marine life. Dolphins can sometimes be seen frolicking in the water, and, in the winter months and early spring, humpback whales join in the display. The unit is conveniently equipped for vacationing comfort; you will find a list of its many features and amenities below. There is a swimming pool and a barbecue area for the use of guests on the property, as well as a private unpaved path to the secluded beach below the cliffs. Kai Nani offers the following amenities: cordless telephone and flat screen color TV. The full size kitchen contains: electric range/oven, refrigerator, microwave, dishwasher, disposal, coffee maker, toaster, blender, and a large array of kitchen equipment. We provide numerous extras, such as beach chairs, cooler, beach umbrella, binoculars, books and magazines, etc., and we now offer FREE High Speed Internet (DSL) and FREE UNLIMITED LONG DISTANCE CALLS, with Caller ID, 3 way calling, and *69. The unit is about 50 feet from the coin operated laundry located in F building. There is a very comfortable king-sized bed in the bedroom, and a double size futon available for guests who do not wish to share the bed. Nakea Kauai Vacation rentals offers three properties for rent, a one bedroom ocean bluff condo at Sealodge in Princeville (Kai Nani), a three bedroom beachfront home (Hale Kai) and a one bedroom beachfront cottage (Punana Aloha). The latter two are both located at the secluded end of incredible Anini Beach. All three properties are owned and lovingly cared for by Bob Nakea and his daughter Suzi. Bob and Suzi are native Hawaiians whose family's roots on Kauai go back to the 1800's. No attention to detail on the properties is overlooked, and each home is furnished with the comfort of its guests foremost in mind. In the North Shore's idyllic setting you can: swim, surf; sunbathe, scuba dive or snorkel, wind surf (with rental boards and lessons available at Anini Beach Park), go shore fishing, book a deep water charter; beach comb, go horseback riding at nearby stables, hike the island's awesome trails, enjoy gourmet dining, work out at the Princeville Spa (featuring daily and weekly memberships giving access to the latest exercise equipment, large lap pool, Jacuzzi, wet and dry saunas, and numerous aerobics, yoga, aqua-size and weight training classes), pamper yourself with a facial treatment or full body massage, whale watch, take a Na Pali Coast boat tour or a sunset sailing cruise in Hanalei Bay, book a helicopter tour of fabulous Waimea Canyon, play tennis, enjoy worldclass golfing, drive around the island and take in the sights, or just simply lie back and bask in the simple glory of being in one of earth's most naturally beautiful and peaceful places. We will be happy to assist you in your activity planning. Just let us know what you would like to do! Spectacular view with patio for dinning/relaxing. Full kitchen more than adequate for making meals. As others have mentioned it is well lived in but well cared for. Quiet grounds, great access to walking path leading to view points, parks, golf course and shopping center with additional dinning. Short car ride to Hanalei, Anini and tons of other beaches or skip the car and hike to the property's secluded beach. A special thanks to Suzi for her pre-visit packet - so many helpful tips to prepare for our trip! Until next time... Mahalo! Perfect place to stay for a few days; the view was amazing and hearing the waves all night was exactly what we wanted. We decided to bring our own towels based on other’s reviews and we were glad we did. The towels are scratchy and the linens could be updated but other than these minor things the apartment was comfortable for the 3 nights we were there. There is a private beach for the apartments but it is a long and somewhat difficult trail. We would stay here again if we come back to Kauai. I was as awed by the view on our last day as I was on the first! The greatest compliment I can pay is that when it came to our last days on Kauai we never considered heading to the south side of the island! In fact we were overjoyed when a snorkel trip we'd signed up for out of Port Allan was cancelled. We so enjoyed our beaches at Sea Lodge and Hanalei Bay we just didn't want anything else! We had totally slowed down during our 50th. anniversary celebration! My wife and I stayed here for the 5th time. We like to end our stay on Kauai at the bluff condo as it is a special place. We love looking at the ocean and hearing it constantly. We saw a lot of whales and albatrosses as usual plus a few [more than] chickens and the morning nene visitors. It is remarkably quiet and the space is just right for us. We plan to be back next year. There were a couple minor issues that were taken care of immediately. Very impressive! The place was good for us for a couple of days. Being so close to the ocean was great. We agree with the other reviewers that the furnishings are pretty dated. This is our fourth or fifth stay and we always love it. Please do not replace blue chairs!! No smoking. Maximum of two people. All rates plus 13.4166% tax. . $200 refundable security deposit required at booking.